It was the last running session on the rugby field for the Wednesday Juniors, just too dark in the evenings now. Future sessions will now be running focussed, still starting from the club house, but out in the local residential areas. Please wear hi-viz (bright clothing with plenty of reflective material) and if you have them lights (Head torch/ankle lights etc.). And just a reminder these sessions are for our yr7+ juniors, sessions led by Dave. 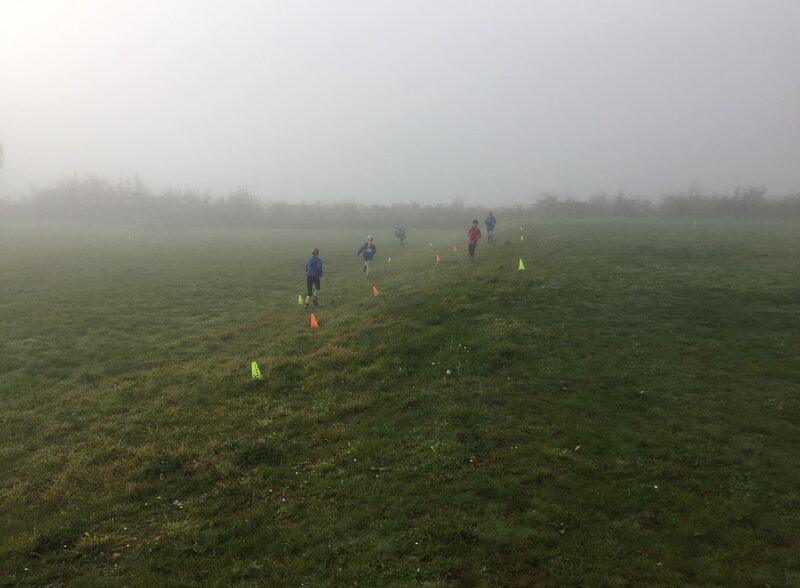 Saturday cross country training was foggy but fun. We focussed on core stability with a few strengthening exercises and our extended obstacle course. Just a reminder; subs are due if you haven’t yet paid and completed the form. And finally we are looking to organise some more winter road running sessions for our older juniors (12-20yrs). 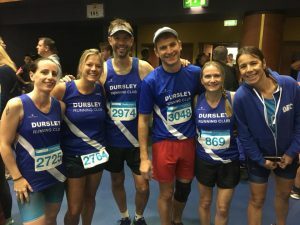 These sessions would be more like our adult running sessions, and are aimed at supporting juniors who look to build their endurance running and/or transition to the adult sessions (which they can do from the age of 16yrs with coach assessment). We have two options for these sessions; Tuesday evenings alongside the adult sessions or Thursday evenings. Please let me know if you (your junior) would be interested and when you would prefer to run. 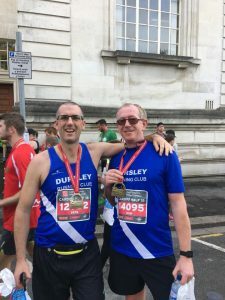 Three DRC Runners lined up for the 9th MBNA Chester Marathon. James Price running his first Marathon, Ben Cardinale and Andrew Kirby. The conditions were ideal for Marathon running with a slight breeze and the temperature just 9oC at the start James Price whose training had been seriously dented by work commitments, went out with the 3.15 pace group; but after being tripped during the 4th mile he decided to push in front of the main group to give him more space. From this position he worked with a small group and started to progressively increase their pace and move their way through the field. At mile 16 James eased back the pace to ensure that he was able to get back safely he continued stongly, moving through the field. At mile 23 James started to lose a bit of pace when he came to the second to last climb he rallied b ut then struggled on the climb at mile 25 and wasn’t able to recapture his pace from earlier in the day in the final mile. James finished first DRC in a time of 3.13.25, an absolutely brilliant performance given his disrupted training and the fact it was his first ever marathon. Ben Cardinale, who has a background in long distances triathlon, was hoping for a time in between 3.30 and 3.45, but was concerned as had not had the level of training that she would of liked going into a Marathon. She went out strong at 3.30 pace leading from the front, at the half way point she was still feeling strong and felt that she could achieve a sub 3.30 time if she worked hard. She pushed hard & got to the 20-mile mark with the 3.30 time in sight. She was fully aware of how tough the last 10k was going to be but she gritted her teeth & attacked the hill sections with vigour which put her in a fantastic position. Ben pushed hard over the last mile & was able to finish in an amazing 3.28.54. Both James and Ben paced their runs very well, with possibly Ben pipping James on this score with 10K splits of 49:52, 49:25, 48:32 and 49:38, also coming 23rd in her category! Behind these two young guns Andy Kilby was running at Chester with Kate Sackett from Ciren AC. Being “old Skool” Andy started hard and held on finshing in 04:14, with Kate doing the same just quicker, Andy wasn’t in a position to use his famous sprint finish in this instance! Results: James Price 03.13:25, 403rd (105th SenM), Ben Cardinale 03.28:54 717th (23rd FV35); Andy Kilby 04.17:41 1879th, 46th MV60. It was a great turnout at the Warwick Tri with at least 20 finishers from DRC Tri. Fran Amigoni was a very proud DRCTriathlete today finishing 4 th woman overall and 1st in her category and it was all pretty close with just two and half minutes separating her from third place! And she wasn’t far off being quickest DRC triathlete overall. It was also a close race between the DRC men, with Paul Breen and Luke Russell battling it out. Paul just edging it by 4 seconds, with Luke working very hard over the run to almost pull it back. There were other close run placings a 6 second gap between Teresa Walton and Annette Heylings of just 6 seconds and 9 seconds between Karen Eadon and jo Lewis. Currently Chris Young results are missing, with start list alphabetical by surname he was almost the last person off so maybe the timer had gone home for him. As ever lots of smiles both during and after the event. 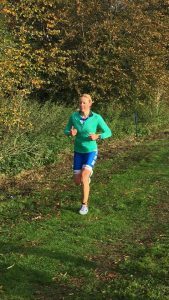 Results Women: Fran Amigoni 01:06:37 4th; Sue Peachy 01:18:08, 44th; Hannah Osborne 01:23:35 77th; Sandra Lewis 01:23:51, 80th; Michelle Ball 01:26:31, 89th; Jess Lewis 01:31:45 124th; Teresa Walton 01:32:20, 127th; Annette Heylings 01:32:26, 129th; Karen Eaden 01:38:16, 147th; Jo Lewis 01:38:25, 148th; Liz McConnell 01:42:52, 158th . Mark Sprigings had a little a warm up for the Obstacle Course Racing World Championships in two weeks’ time. He posted: “Today just a little warm up ready for the real deal in 2 weeks’ time! Was great to wear and compete in my United Kingdom top for the first time and bump into a few other representing the country at the World Champs. 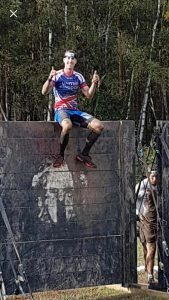 Decent result today, and had I not stopped on the final obstacle at the top of a 9ft wall for a photo opportunity and wave to my kids I would’ve won the event! Mark S said this hi under no illusion that the “worlds are going to be a whole different ball game!” Well done Mark! 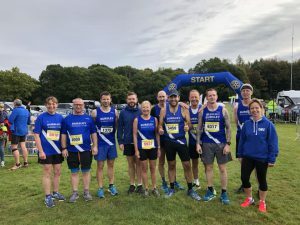 12 DRC athletes completed the Cardiff Half, with Nick Fennell leading the team home in ju st under 01:49, with Pete Dunn hard on his heels and Hugh Poppy hard on his! Liz Fairall was first DRC woman in a smidgen over 2 hours with training partner Nicki Squire running a big PB behind her. 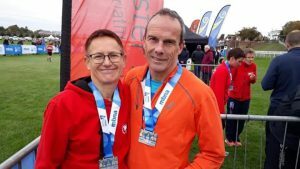 Rebecca Halford ran her first ever half and posted: this was the biggest challenge that I’ve set myself so far. The pain set in between miles 6-11 and I ache all over! I am so proud to have completed it in 2hrs 48mins. Massive thank you to everyone who supported me and especially Mum and Dad who came all the way to support me. Also my amazing running buddy Cara who I lost at mile 11!” Not all runners results are up so no official result yet for Louise Beck but she got Sam Stevens and herself to the finish, Well done both! 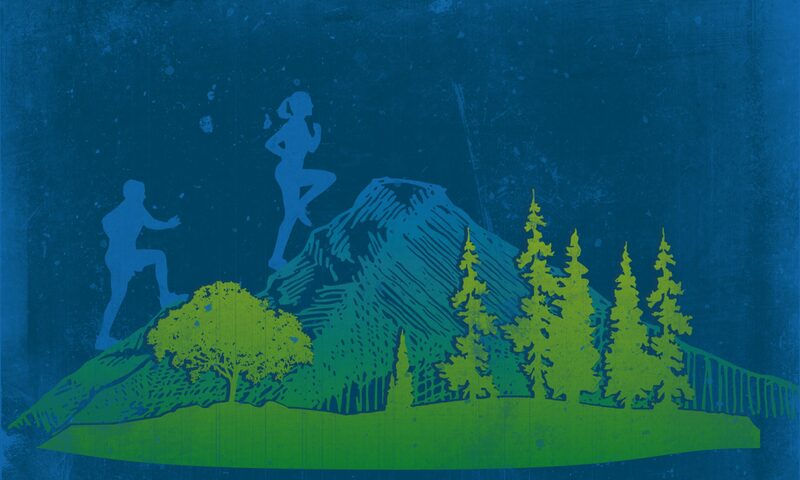 12 tough trail miles, 10th Feb 2019, great fun. It’s the 30th anniversary of this signature event. 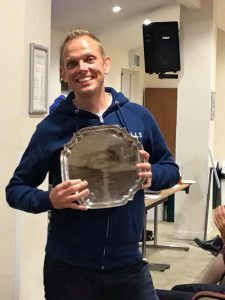 Kris Rymer celebrated his award as “Best Running Buddy” by taking himself down to Barnstaple, on his lonesome for a change. Completing his first ever Marathon Kris completed it in a great time of 03:44:57, 03:44:57, 66th overall and 21st MV40, he said “I think I have earnt the beer and chocolates”, to be fair I think he needs more than one beer! Super year of running continues for Kris. 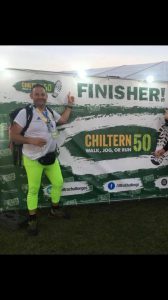 Another member deciding to “go long” this weekend was Graham Wilkes who completed the Chiltern Ultra 50km event in 11:11:12, just one second off a number that woud have made Neil Truelove delirious! Well done Graham. 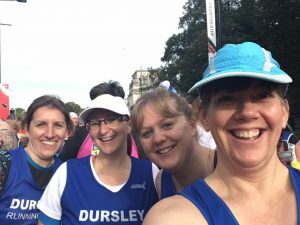 At the AGM we spoke about the number of Miles DRC members do each week, Sunday saw another 280 odd miles added by the Half Marathoners at Cheltenham and the Forest of Dean Autumn Trail. Weather conditions, after a warm Saturday were idea for running. Forest of Dean Autumn Half 12 DRC athletes completed the course, which is like an awesome XC course. A quick downhill start, (if you are unwise) leads to a sustained climb after which a rapid descent means there is only one way home, and it’s up! The last thr ee miles being gentle uphill gradient, but feels steeper! Great efforts by all just getting around, and at the sharp end some seriously quick runs Matt Hazell-Livall just over 90 minutes with Ben Amigoni and Simon Jones not far adrift. Simon was really pleased with his 16th position, after a summer of little running this was a great result for Simon . As ever in the age categories DRC delivered, Martin Bragg an excellent 2nd M60 in 01:36:54 and Alice Lewis first DRC woman home and 3rd F60. Damian Lai, had the benefit of this wingman, Darren Kitchin, who had funnily enough just received the Best Supporting member! With a little bit of help from his friend Damo ran a PB, pretty awesome of this tough course. Results: Matt Hazall-Livall, 01:30:19,, 38th , (23rd Sen M); Ben Amigoni, 01:32:42, 51st , (31st Sen M); Simon Jones, 01:33:26, 54th , (16th M40); Martin Bragg , 01:36:54, 91st , (2nd M60); Darren Kitchin, 01:46:53, 229th , (39th M50); Damian Lai , 01:46:53, 230th , (69th M40) ; Alice Lewis , 01:53:32, 351st , (3rd F60); Rachel Brown , 01:56:22, 14th (14th F45; Kevin Brockway , 02:06:01, 599th (92nd M50); Paul Lewington , 02:06:40, 604th 21st M60); Claire Troy , 02:17:09, 785th (45th F45); Annette Heylings , 02:29:15, (898th (16th F60). 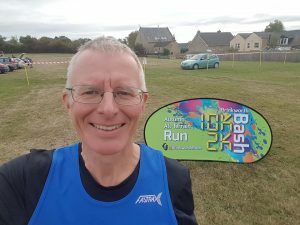 Meanwhile Alan Honey was showing all the Old Men how to take a decent selfie down at the Brinkworth Bash 10K off road race. 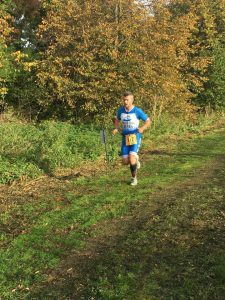 First in the Wiltshire Off Road League Alan may h ave been getting some early Cross Country Training in for the Glos AAA series! 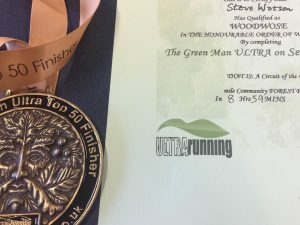 I am currently struggling to find his name on the results sheet but Alan reported “The main event was over a mixture of terrain including fields, farm tracks, roads and a narrow path through a wood. There was a field of around 150 runners and a relaxed friendly atmosphere. I was pleased with my time of around 51 minutes”. 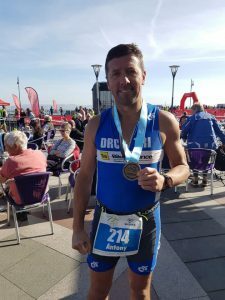 DRC Tri – The calm after the storm! 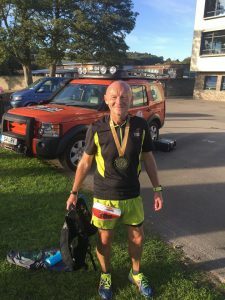 Tony Ball was over in Wales on Saturday, a total contrast to Weymouth last week (Paul Breen described the swim as a co mbination of swimming and surfing to me! ), the Welsh water was like a millpond. The event covered 750M swim (which was bay the look of the image downhill? ), 32K bike and a 5K run. Tony was a Vintage Veteran? And finished in 2:00:16, 125th out of 330, closing in a top quartile overall position which is always good, and was an excellent 7th in age category. 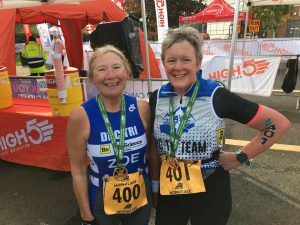 Zoe Lammerton and Jo Robinson ventured to the K2 sports North Bristol sprint tri at Tockington Manor on Sunday. Zoe reported “A lovely low key friendly event. Wave times were spread out over morning so we were both in the 11:00 wave. A slightly hectic swim with them setting us off at 5 second intervals, a quick transition for me (no wetsuit) and off out on the bike. A short 300 metres climb up onto the A38 took us on two 6 mile loops with a downhill bit after each loop. The run was twice round the rugby pitch field and an out and back on a road and farm track (one sneaky climb too). Really enjoyed it DRC Tri must do this next year! !” Zoe finished in 1:11:36 and 2nd in age category, Jo Robinson completed in 1:22:35 Zoe said “thanks Sarah Willcox for coming to cheer us on” Anne Roberts ventured further so South to the Exmoor Open Water swim at Wimbleball Reservoir today, completing eth $km suim in 01:24:59, 2 minutes by 100m!